This 79 page Themes in Literature Unit is complete and ready to teach! 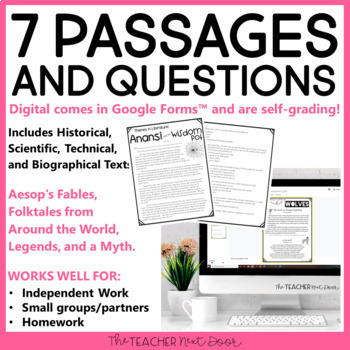 Your students will get plenty of practice in a variety of formats as it includes 7 passages (front and back with many paired passages) including Aesop's Fables, Folktales from Around the World, Legends and Myths, a set of 32 task cards, handouts, graphic organizers, a picture book list, and 21 theme posters. SAVE MORE and GET MORE with the Reading Bundle for 4th and 5th Grade!!! (Click Here) It has 10 key reading units which cover many 4th and 5th reading standards! Here are the units included in the Reading Bundle for 4th and 5th Grade! It includes theme passages which are high interest ones your students will enjoy, like Anansi and the Wisdom Pot! Some of the passages are short paired texts on a single page. 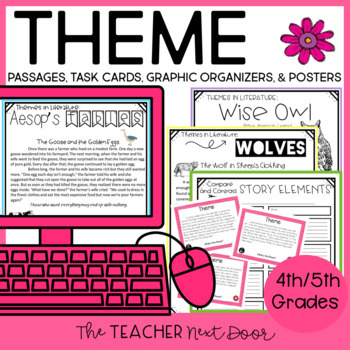 There are a variety of formats included from passages, to posters, task cards, a mentor text list, graphic organizers, writing pages, and more! 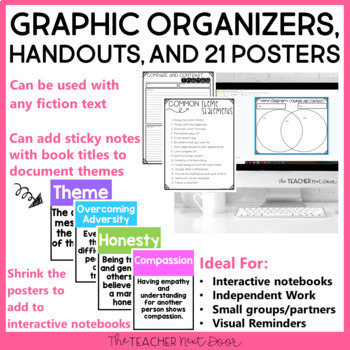 The theme posters allow you to chart the themes of books you read as a class (or individually) for the whole year, allowing you to spiral learning! 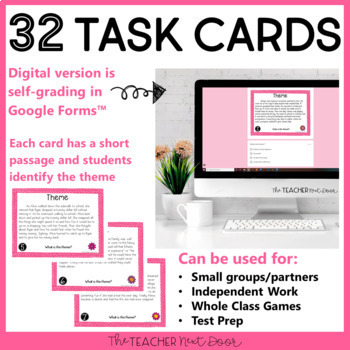 The task cards have 32 mini-passages which are lots of fun and have a variety of themes! The printables are low prep for busy teachers! It may be used in a number of ways from guided reading, to reader's workshop, independent work, literacy centers, exit slips, homework, whole class games, test prep, and more!!! Also, I do want to suggest a great set of reading games which would go well with this reading unit. There is a game for EACH READING STANDARD!!! It comes in a set of 10 for fiction, a set of 10 for nonfiction, or a bundle of 20 reading games specifically for 4th and 5th grades!